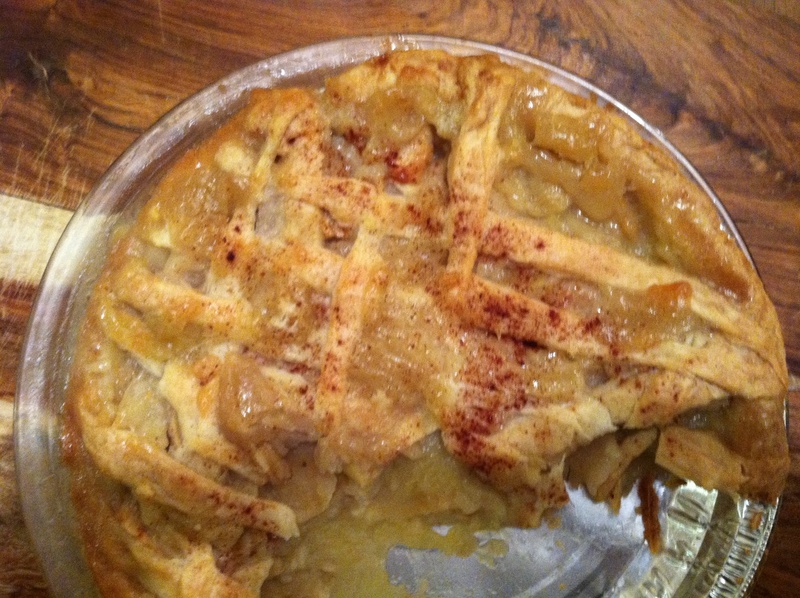 Using the sugary, ripe apples of Threshold Farm, Francesca baked a savory apple pie to share with friends and family upon our return. Over bites of warm apples and refreshing ice cream, we recounted our first farming adventure. It was a week of mastering an English accent to rival that of our fellow wwoofer, a week of pure, hard and rewarding work, and a week that inspired us to be more conscious food consumers. Needless to say, we were downhearted to see the week come to a close. The sharp contrast between the quiet farm and the over-stimulated island put both of us in a bit of shock as we adjusted to city life once again. With one adventure ending, a new adventure was soon to start. I departed for New Orleans one week later. I gave myself one week to reacquaint myself with my beloved city, falling in love with New Orleans over again. One of my first priorities returning to the Big Easy: a fried oyster po-boy. Fully dressed and overflowing with oysters, when my teeth sank into my first bite, I knew I was back. My partner in crime, my college roommate for four years, landed in New Orleans a few days later. Together, we caught up with friends, saw some live music, and visited the alumni tent at the Tulane tailgate. It was a good week. Now, however, the real adventure in New Orleans begins. 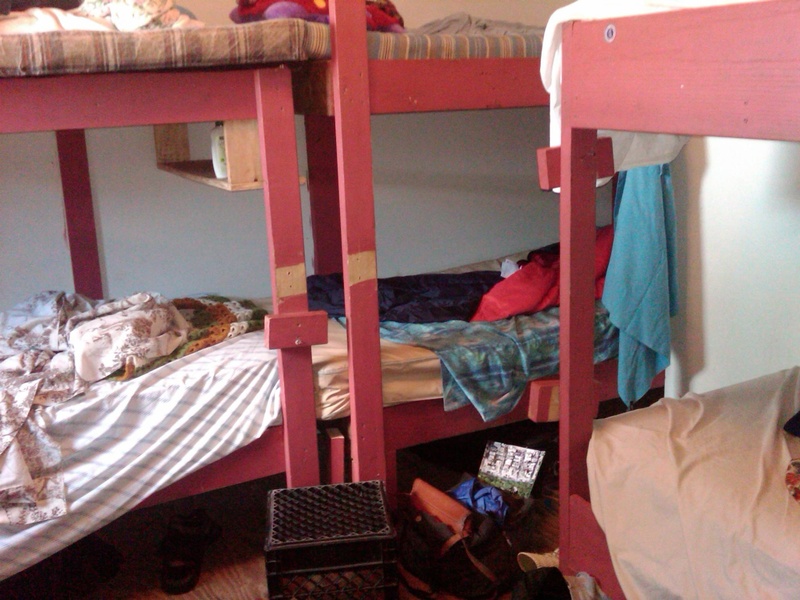 I came down to work with the non-profit, Lowernine.org for three weeks. The organization rebuilds homes in the post-Katrina Lower Ninth Ward and operates an urban farm. I will be living in the volunteer house with around fifteen other volunteers in the same neighborhood that we are working to restore. My impetus for this adventure is to give back in the slightest to a city, a culture, and a community that has given me so much. 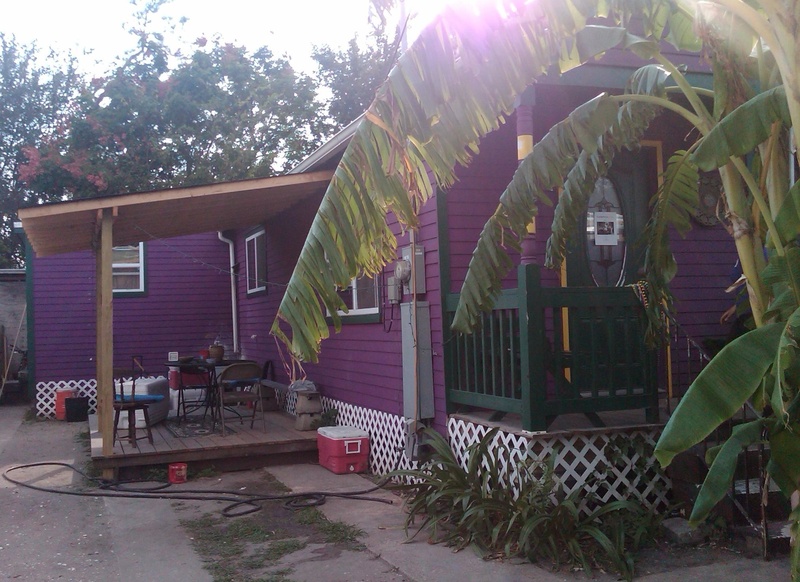 Let’s bring back more of the funky-colored shotgun houses and grow some veggies. Stay tuned, we’re in NOLA now. When I first heard of biodynamic agriculture, I didn’t take it to be any different from organic farming. I assumed it adhered to the same basic principles: no pesticides, fertilizers, hormones, just the good stuff. Little did I know that it involved so much more. Since I myself am still learning about biodynamics and all that it entails, I will do my best to share with you some of the knowledge that I gained while at Threshold Farm, a biodynamic farm. – Biodynamics is indeed a method of organic farming. – The farm is viewed as one, single & unified organism. There is a deep focus on the interrelationship of animals, plants, and soil as a self-regulating and self-sustaining unit. Biodynamics understands that all organisms are interdependent and the system uses those relationships to the farm’s advantage. For example, Hugh and Hanna (the farmers) allowed their chickens to roam the farm. The chickens’ instinctively scratched at the soil, foraged for insects, and left their droppings as they wandered. The chickens, therefore, served the farm as soil turners, pest controllers, and fertilizers. – Biodynamics limits the amount of external inputs into the farm. Farmers grow the food the animals need right on the farm. Think of how the farmers at Threshold Farm fed the rotten apples to their cows, making complete use of the apples (previous day’s posts talks about this). 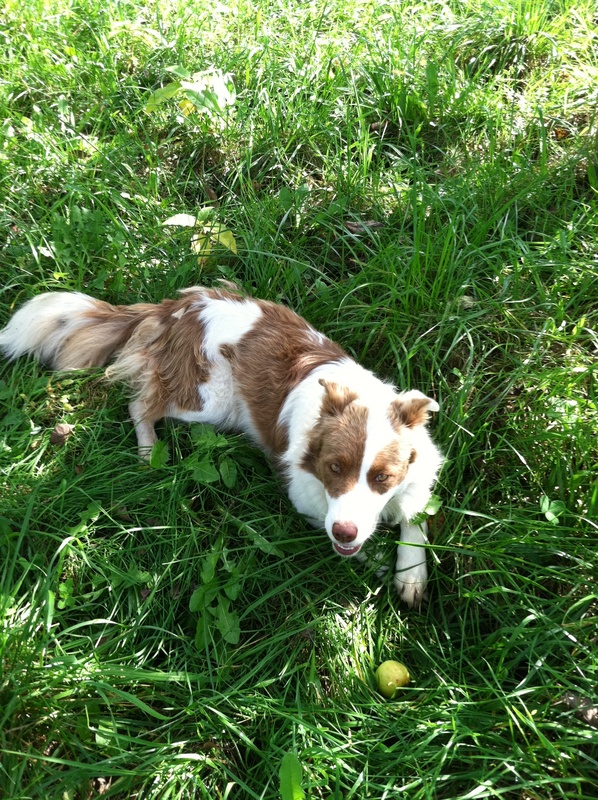 The herding dog, Biscuit, scavenged most of her meals and would often eat an afternoon snack of an apple. – Use of manures and compost to fertilize the soil. On the last day of our visit to Threshold Farm, one of the cow’s had unexpectedly died during the night. The cow was a healthy, young girl of about 6 years of age. Most of their cows live until they are about twenty so the farmers’ were fraught with worry that the cow’s death was caused by something of their doing – a staple overlooked in the field, an oversight of symptoms. Each cow at Threshold Farm had a name, and knew that name when she was called into the barn from pasture. This cow, Felicia, was no different. After a morning of worry, the autopsy showed that the cow had a weak heart and had probably died of a heart attack. Although the farmers were still upset because of the huge financial lost involved with losing a healthy cow, they were much relieved that the death was something that could not have been prevented. The cow’s purpose on the farm did not end in her death, however. Her body was added to the compost pile so that she may continue to bring life to the farm, nourishing her caretakers and fellow cows. – Use of an astronomical planting and sowing calendar. The calendar takes into account the solar, lunar, and earth rhythms. When farming rhythms and these natural rhythms collide, biodynamic farmers believe that their crop will have an increased life force, nutrition, and vitality, which will then enhance human life and nourishment. – Originated out of the work of Rudolf Steiner, the founder of anthroposophy. To learn more about Rudolf Steiner, visit Who was Rudolf Steiner? One must taste food grown on a bioydynamic farm, feel the richness of the soil in her hands, and understand the contentedness of the farm’s animals to truly comprehend biodynamics. 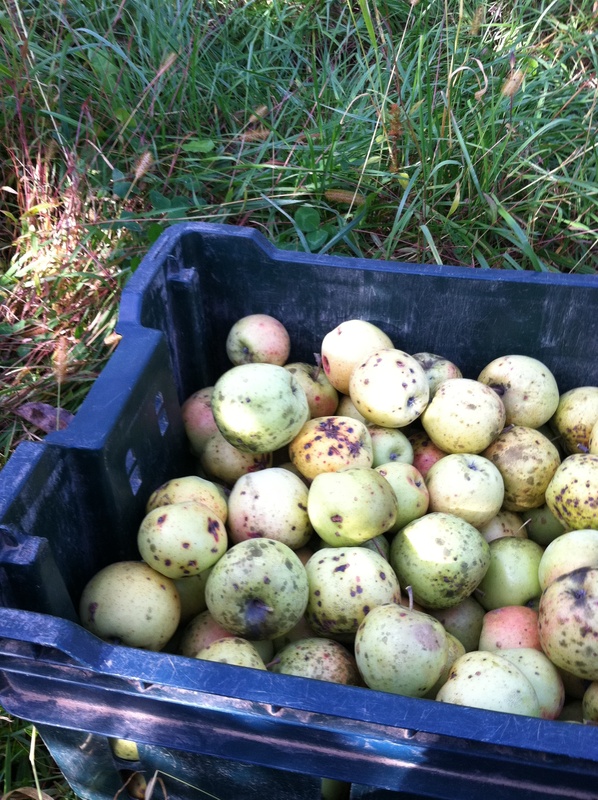 Taste an apple from a biodynamic farm, picked right off the tree and you will know. We had come at the just the right time to take part in the quintessential fall activity – the harvest. 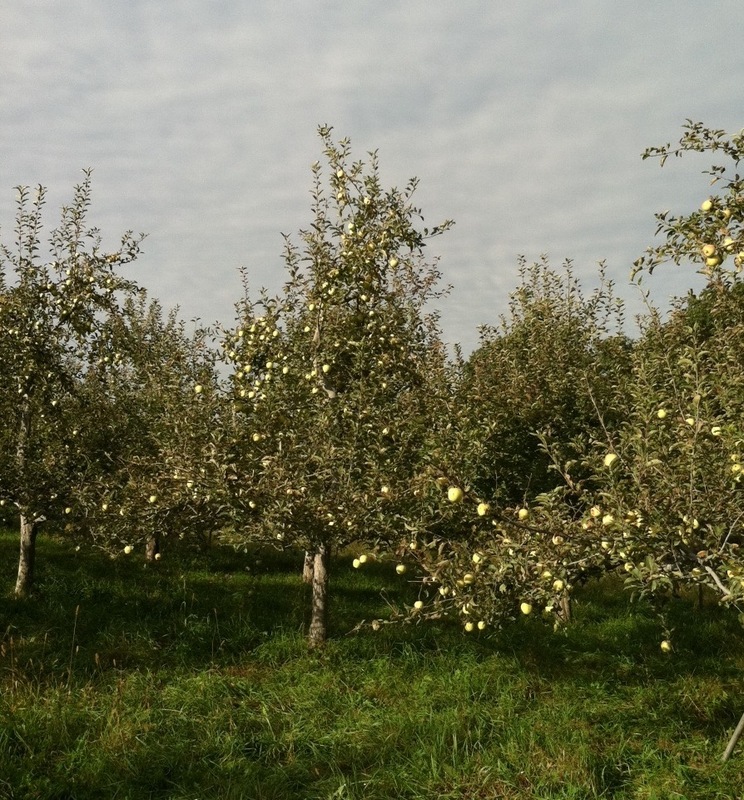 The chilly fall nights and warm, sunny days of the fall provide the ideal temperature fluctuation for the apples to change their starches into sugars, thus leaving us with five acres of trees laden with beautiful ripe apples. Walking down the rows of the orchard, I was overcome with awe over the sheer amount of apples. Everywhere you looked, a Fuji, a Golden Delicious, or a Jonagold apple was begging to be picked before it fell to the ground and bruised its delicious flesh. To get started, we each got an apple picking bag, a rather helpful tool for this kind of work. 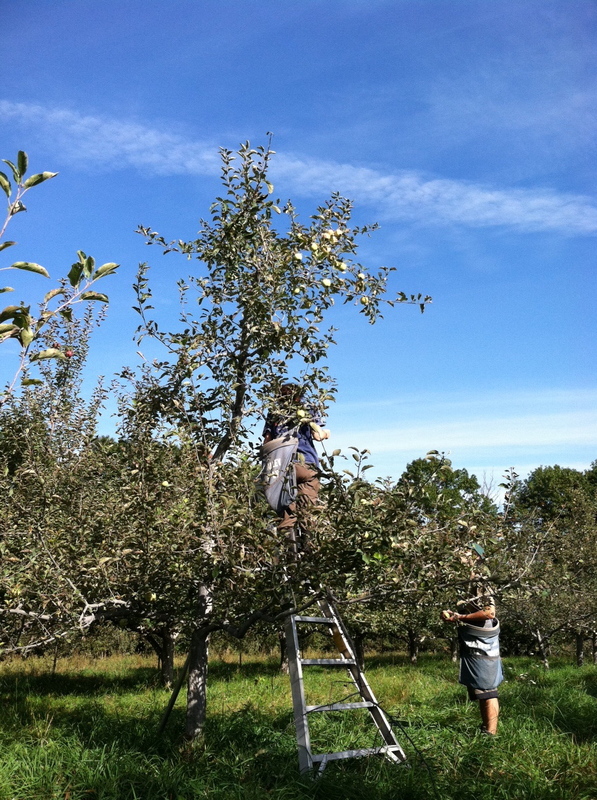 We were told to start at the top since the apples receive the most direct sunlight there, and therefore ripen fastest. I was hoping Hugh would have some genius way of getting the apples from the top of the trees while my two feet were firmly planted on the ground, but my hopes were quickly crushed. In order to access these rosy-cheeked apples I had to get on a ladder. Now, I’m not the most graceful, nor balanced person, so the ladder was a bit daunting. Climbing seven feet plus into the air with a bag full of apples across my shoulder wasn’t ideal, but those apples needed a picking. I scouted the apples on the top that seemed to be blushing red. Then I began to place the ladder. Reaching a lofty 5 feet 2 inches, maneuvering the seven foot ladder was a task in itself. With the ladder firmly placed in the ground, I began the ascent. I was filling my apple bag up rather quickly, making trips up and down the ladder to unload the bag. My confidence was building and I was picking up speed. I was reaching for those apples, greedy to get them all with minimum ladder readjustment. I caught sight of a beautiful round apple, with just the right amount of a pale green under-color. It was just out of arm’s reach, and I was reaching. Suddenly I felt the ladder getting a bit shaky. In one of those moments of clarity, I knew I was going down. Down I went. While in midair I screamed out to my sister, Francesca. She came rushing over to find me on the floor laughing at myself. My theory: my big hiking boots with advertised “great ankle support” helped me land without twisting, breaking, hurting, or spraining anything. I certainly learned my lesson. My initial caution returned, which is probably a good thing when you’re seven feet in the air with thirty pounds of apples on your shoulder. And so the day of harvesting continued, with my hand always on a supportive tree limb. With everything set for our week on the farm, Francesca and I woke early to flee the city and avoid the morning traffic. A bit cranky due to the early departure, we cruised along in silence breaking it only to scoff at the people as they began their workday. It was a beautiful, sunny day and everything was running smoothly, or so we thought. About fifteen miles out, and while on a major highway, I smelled something burning. Sure enough the hood of the truck was smoking up. We pulled into a gas station and called our friend, Patrick, to have a look under the hood. After all was said and done, we had a bill from a towing company, no car, and bad spirits. Karma caught up with us for laughing at the businessmen earlier that morning, and we were forced to return to the city. Luckily our stubborn natures kicked in and we started to plan how to get out to the farm, a three-hour trip upstate. Repeating the mantra, “when there’s a will there’s a way,” had sustained our motivation and we arrived at Threshold Farm just before noon the following day. Upon arrival, we met Hugh, a biodynamic farmer from Australia. Intimidated and way out of my element, I explained to Hugh that this was our first time wwoofing and first farm experience for that matter. Hugh shrugged my qualms off, and immediately began to show us how to change the fence line for the cows to graze a different pasture. We followed him closely, soaking up the lingo and instructions while trying to keep up and sidestep cow dung piles. Lunchtime came and with it, an explanation of our expected duties and responsibilities while on the farm. We were to rise at 6:30 for breakfast, help cook and clean, and work five to six hours a day. During the week, we would be picking apples, packing apples and planting garlic beds. I began to grow excited. I was ready to get my hands dirty, to do some real work. This is what I had been waiting for, to see a small-scale organic farmer providing food for local customers and succeeding at it. I had a gut feeling that I was in the right place. Stay tuned for more adventures on Threshold Farm! I will be posting again tomorrow. A brief respite from a rainy week prompted the family and I to take a trip to the Brooklyn Botanic Garden. We spotted turtles peaking their heads above the water in the Japanese Hill and Pond Garden and wandered through the various flower collections, pausing of course to smell the roses. Comatose and satisfied with a belly full of butternut squash soup, we traced the paths indiscriminately until we stumbled upon Patrick Dougherty’s installation. That stopped us in our tracks. The artist’s whimsical installation made solely of sticks can transport even the cynic to a fantasyland. Combining whirls with architecture, the contradictory elements unite to create something out of a woodland storybook. Keeping with nature, Dougherty’s work looks effortless, as though it simply came to being. The ephemeral nature of his works, usually lasting no more than two years, pays homage to the fragility that is life. I highly recommend a visit to the Garden to see this installation. You just may find me curled up on the floor, with a twig wand in hand. 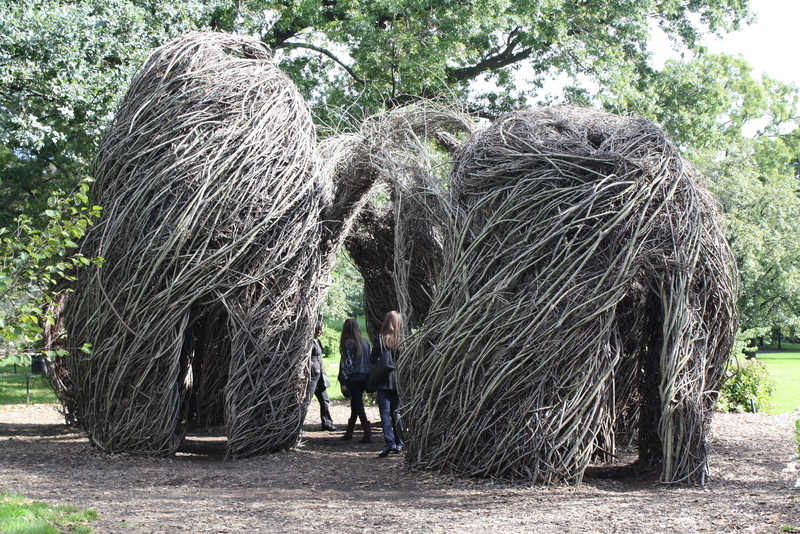 Click here to check out more work by Patrick Dougherty.